Is there someone about to have a birthday that just loves everything about golf? Then a golf birthday card is the way to go. Generally, most golf cards have tiny golf art and graphics of all sorts. 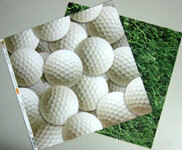 However, this golf greeting card has a larger than life golf ball right in the center. This sets it off from the rest. Hence, the 3D foam effect is just icing on the cake. ...I guess the one on this card will have to do. Score and fold the white 8.5” x 11” cardstock into a 5.5” x 8.5” card. Draw and color a big golf club with 1” handle about 3.5” from top of the folded card. Hence, the finished card will have about 5.5" length and 5" height. There’s no need to color the center of the club where the golf ball will fit. 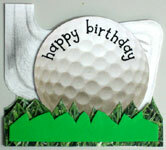 Cut out and glue the grass cardstock to cover up the bottom of the golf birthday card below the club. This creates the illusion of the grass behind the club. Cut out two 4” golf balls. Glue the first golf ball cut out in the center of the golf club. Cut out the final card shape by tracing the perimeter of the club, ball, and grass. Cut out a piece of 1.5” x 5.5” grass paper strip with zigzag top. This zigzag top should follow the weaves and bends of the grass. If you have flimsy cardstock paper just like this grass one and you want it to have some rigidity, glue it on a piece of white cardstock to support it before using it. Then, cut out and use this new thicker and more rigid creation. On the green foam piece, draw and cut out a strip of the similar silhouette as the grass strip but about with ⅛” margin all round. 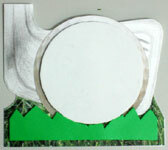 To save time, use the grass cut out shape to trace the silhouette on the foam board. On the white foam board, draw and cut out a 3.5” circle. Place the green foam strip and then the white round foam piece on the card. Play around with them to trace out the section where the two intersect. Then cut off this intersecting part from the green foam piece. Next, glue the white round foam piece in the middle of the golf ball and the green foam piece about ⅛” away from the left, right, and bottom edges. 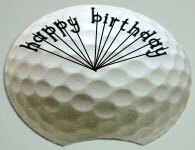 On the second golf ball cut out, use the black alphabet rub-ons to print “happy birthday” on the round curvature of this cut out. To create the letters on the curved surface, locate the center of the golf ball. Then, use that center to align the letters with imaginary lines. Glue this second golf ball cut out right in the middle of the foam strip. This time, using 1.25” x 5.5” dimensions, cut out a another piece of grass paper strip with zigzag top. Remember, the zigzag top should follow the weaves and bends of the grass. On the green foam piece, draw and cut out another strip of the similar silhouette as the above grass strip but about with ⅛” margin all round. Glue this foam piece on the grass section maintaining the same ⅛” margin. 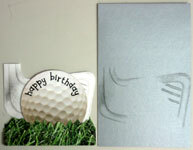 Finally, glue the last piece of grass cardstock strip and the golf birthday card is done. To save time, it's simpler to use a background color that suits the golf club. 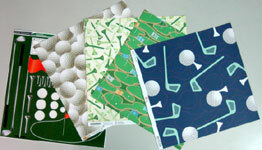 For instance, instead of plain white cardstock, use grey or metallic cardstock to draw the golf club. 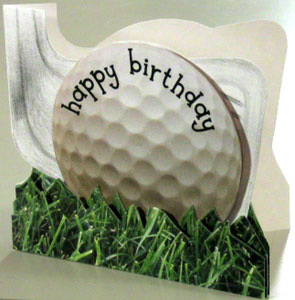 This golf birthday card uses colored foam pieces for added effect. If you don’t have any colored foam piece, feel free to use regular white foam board.